Great music can momentarily transport you somewhere else and Sundowners did just that on a dreary bank holiday at a packed Telford’s Warehouse. The night had the feeling of a homecoming as friends, family and new fans alike watched a band at the height of their powers. It’s been a successful few months for the Wirral five piece following the release of their eponymously titled debut album. They have just completed a successful support slot on Paul Weller’s recent tour and have a string of festival dates ahead. Given the way that things are happening for the band, gigs at venues of this size will be a rarity in the future. The night opened with singer-songwriter Marvin Powell’s blissed-out acoustic tunes. He was the perfect warm up to the main act. So too was the mix of music played between the two sets, a flavour of what was to come from the headliners. 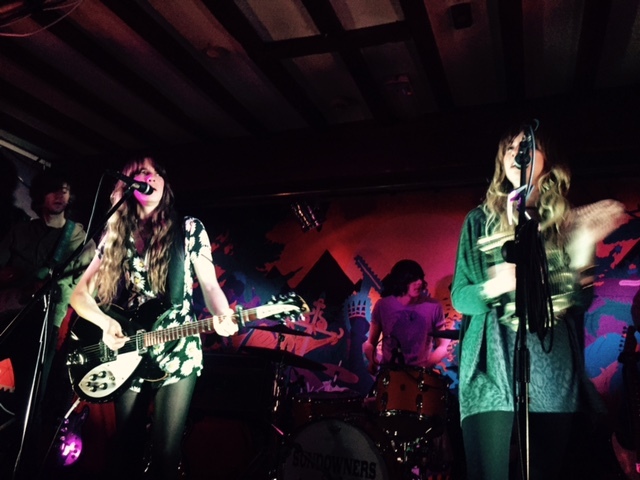 Sundowners album is a mix of psychedelic, folk, pop and rock influenced tunes, but live the songs take on another form as you would expect from a band that been around for a few years developing their craft. You can hear their influences which range from acts such as Tame Impala, Can, Neu!, Portishead, Air, Fleetwood Mac, Velvet Underground and Fairport Convention. At times they sound like The Coral, which is not surprising as singer Fiona and Alfie, are related to James and Ian Skelly from the band, who incidentally produced their debut album. That said they are more than the sum total of these influences, they are developing a great sound of their own. Within a few bars of their set they showed what they are all about. The singles Into the Light and Hummingbird are the stand out tunes and highlight perfectly the stunning harmonies of singers Niamh Rowe and Fiona Skelly. The mesmerising vocals are more than complimented by the exceptional backline that are not afraid to let loose when the chance arrives. They do so adeptly during If Wishes Were Horses, which sounds like what the Bunnymen would have sounded like if Stevie Nicks had joined to record Heaven Up Here. Soul Responding is a delight, and encapsulates what the band are about. Sadly moments don’t last forever and the gig had to end. Catch them if you can in the near future and be prepared to be blown away.